How can strategic professional development at technical and community colleges help achieve equity and foster student success? And what role can WestEd’s Reading Apprenticeship play? 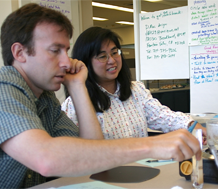 From 2006 through 2015, two cohorts of 16 community and technical colleges in Washington state committed themselves to Achieving the Dream: Community Colleges Count (AtD), an initiative designed to achieve equity and support student success. As part of this initiative, College Spark Washington conducted an independent, third-party evaluation to document and evaluate the impact of AtD. In Post-Achieving the Dream Study Issue Brief on Large Scale, Strategic Professional Development, the third in a series of briefs analyzing the initiative, College Spark Washington focused on three colleges that took a large scale and strategic approach to professional development, and articulated lessons learned, with implications for policymakers, practitioners, and administrators. Among the three AtD colleges, two, Renton Technical College (RTC) and Bellington Technical College (BTC), adopted the WestEd Reading Apprenticeship approach. After working with WestEd for nearly a decade, and with over 100 faculty and staff trained in Reading Apprenticeship, RTC found increased retention rates, from 50% to 85%, as well as gains in test scores. Key factors of this success, according to College Spark’s evaluation, included having a committed faculty member on board, faculty driven implementation, and a robust dissemination framework. BTC adopted Reading Apprenticeship professional development with the goal of integrating best practices in reading comprehension with curriculum and instruction. According to BTC, almost 4,000 students were enrolled in courses taught by instructors trained in Reading Apprenticeship. BTC reported that students taught by trained instructors did better in reading and fundamentals of English. From faculty and staff focus groups and solicited student feedback, the college found that these students were more engaged in the classroom and completed more classes than students in classes not taught by trained instructors. BTC also found students made strong social connections with their group partners. College Spark reported that strong leadership support, a committed faculty member, a community of colleagues, and a cadre of trained staff, were key to BTC’s success.